Apple trees (Genus – Malus) originated in Central Asia and then spread to Northern Europe. In the 17th century they were taken to North America. Worldwide, measured in tonnes, China is the top apple producer, the United States of America coming second. Poland is the largest apple producer in Europe. In Poland in the countryside and even in the towns most houses have at least one fruit tree in the garden – often more – with apple, plum and cherry being the favourites. In my garden there are two Bramley apple trees. Jabłko is the Polish for apple – jabłecznik is an apple cake. Some people use the word szarlotka – but my mother used that word for apple crumble. Apple cake is made with tart cooking apples – Antonówki are very popular in Poland – these are similar to Bramley apples and the apple filling is kept slightly tart so that the sweetness in the cake gives a lovely contrast. I think there are as many variations of this cake as cooks in Poland. This is my mother’s version which I think this is the very best. Do not make it too much of a purée, cook so that you have some soft apples but with some harder less cooked chunks as well. Leave the mixture to cool and then add the ground cinnamon. 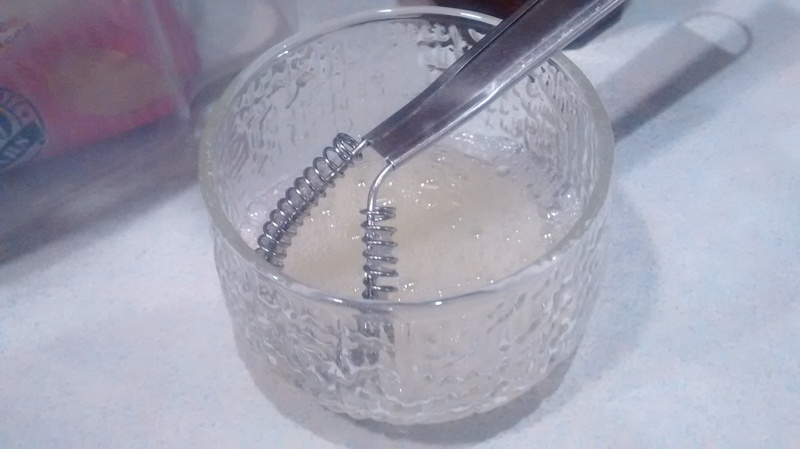 The mixture should look quite brown. When I have lots of apples, I cook a large amount and portion this up and keep them in the freezer – better to leave out the cinnamon if freezing and add this fresh when making the cake. You need a round tin with a loose base or a spring form tin or you will not be able to get the cake out. I always use an anodised aluminium tin, 22cm in diameter and 8 cm deep, which does not rust. 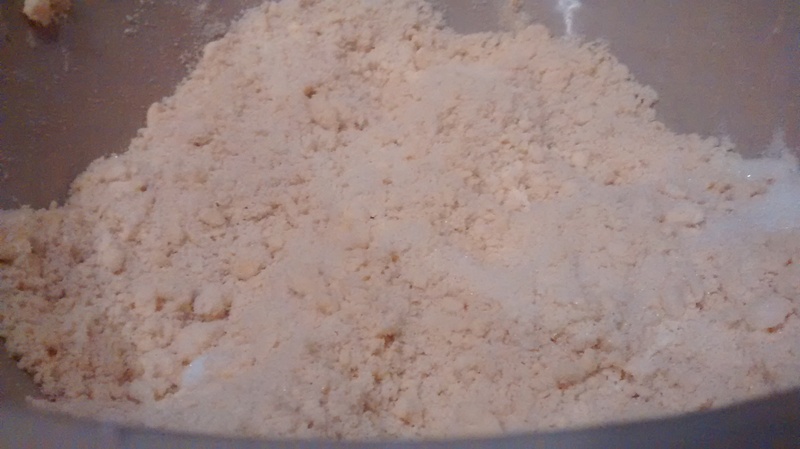 Rub the butter into the flour to make fine crumbs and add the sugar. Add the egg yolk and the lemon juice to and mix together to make a soft “dough” (try not to add more flour), handle it as little as possible. Leave it to chill for about ½ an hour as this makes it easier to handle. Pre heat the oven to GM5 – 190oC. Take slightly more than half the dough and press it into the cake tin. Spoon the apple mixture on top of this. 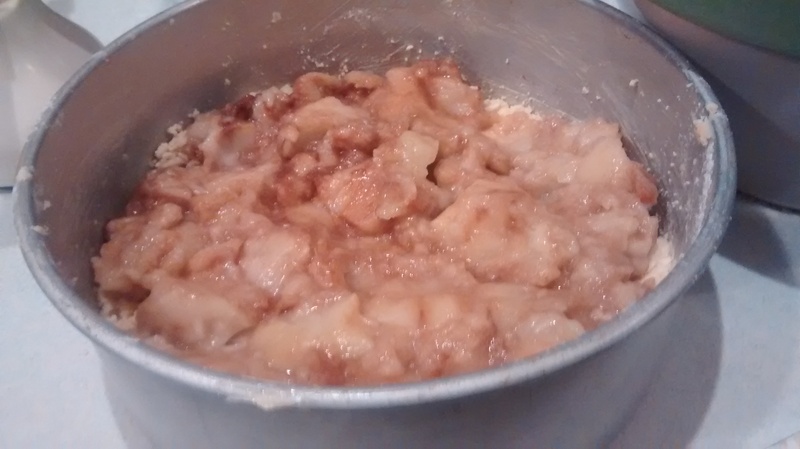 The rest of the dough will go on top of the apple mixture. I use a rolling pin to make a circle that is smaller than the tin diameter and then place this on top. Do not worry if the dough falls apart, just place it on with the breaks nearly touching. Slightly beat the egg white with a fork and brush this over the top of the dough. You will not need it all. Liberally sprinkle caster sugar over the egg white. Bake for around 50 minutes until the top is a golden brown. I tend to check the cake at 40 minutes and will cover the top with greaseproof if it starts to brown but is not yet cooked through. Leave to cool before getting the cake out of the tin. I use a tin can and put the cake tin on this and slide the side of the cake tin down. Do not put the cake in a air-tight covered container as the apples absorb moisture and you loose the crispness of the cake. I hardly ever have any left anyway as I seem to get visitors as soon as they know I am baking this cake. Tea plates are Stardust by Colclough from the 1950s or early 1960s. Not sure if I have made this for you or not, but yes it is scrummy, as Stefa says, the absolute best!